Ciliberto and his colleagues measured the overall environmental impact of the changes in chemical use that have resulted from the adoption of genetically modified crops, using a measure called the environmental impact quotient, or EIQ, to account for chemicals' impact on farmworkers, consumers and the environment. Comparing adopters to non-adopters, they found little change in the impact on farmworkers and consumers. However, the adoption of genetically modified soybeans correlated with a negative impact on the environment as increased herbicide use also increased contamination of local ecosystems. I should point out that genetic engineering of crops isn't all necessarily about and often isn't all about making the crop insect pest resistance or herbicide resistant for the are MANY completely different kinds of advantage that could be genetically engineered into the crop that have nothing to do with insect pest resistance nor herbicide resistant. I should also point out that the same crops could have been created to have those traits, albeit with vastly much more time and cost and very inefficiently, by selective breeding and with exactly the same impact on the environment, thus rendering the question of "what is the environmental impact of genetically modified crops" a completely wrong question and an irrelevant question. Any study that tries to answer that flawed question is flawed as a result. It is just like a study that tries to answer the question of "what is the environmental impact of selectively bred crops"; it is completely flawed for the same reason. A less flawed albeit still a very badly flawed question for a study to try and answer would be "what is the environmental impact of crops with a certain trait" where that "trait" might be, for example, insect pest resistance. BUT even that question would be extremely badly flawed for the impact would just depend on a vast number of variables and factors. I think to try and make that question specifically about genetically engineered crops rather than merely selectively bred ones makes the question completely idiotic; why pick on engineered crops in particular rather than selectively bred ones or, say, red-leafed or hairy-leafed ones, or some other completely arbitrary and irrelevant chosen characteristic the crop may have? Also more important: how fast do the herbicides break down. Just saying "more herbicides are used" is meaningless without taking that variable into account. If they disappear in a short enough time, no harm done. If they persist and accumulate, it's trouble. It is possible to get this right eventually, but we clearly need extremely tight standards for testing and application of any toxic substances to food production. But that needs enlightened government! We are killing ourselves with poison for the profit of farmers and chemical manufacturers. The spreading of alergenic bacterial proteins and virus vectors into the wild is probably the most significant problem of GMOs. No it isn't. There is no evidence n rational reason to believe this at all. No commercially available crops contain allergens that have been created by genetically engineering a seed/plant. And the rigorous testing process ensures that will never happen. There have merely been a few irrational scares from people scared by GM. There is absolutely no evidence we, in general, are all dying or will ever die from poisons from chemical manufacturers. In fact, quite the opposite; the chemical manufacturers are helping to prevent pests causing devastating crop failure + they make fertilizers thus help with food security and reduce world hunger and poverty + many life saving medicines are made from chemical manufacturers etc. thus, for most of us, making our lives longer and better. Standard GMO tests for toxicity required by FDA and done by Monstanto are just ninety days long. -and those tests are not the only ones done so that is irrelevant. Your link is totally moronic; there is NO evidence of a causal link between GMO and allergy. Try going to proper scientific websites no authored by loonies with a political agenda who are just historically vomiting out hateful propaganda crap but rather REAL scientists and came back to us. What does that even mean? Actually we are killing ourselves with over population. There is a point where we will not be able to keep pace using more efficient crops. Until you get the population under control, all the other problems will never be resolvable. CO2? Poisoned water? Climate change? Air pollution? Pfffft, none of those can be solved with the population increasing exponentially decade after decade. But the news is not all bad. After we are gone, surely some bacterium will be left to began the process all over again. Does anyone truly believe the Universe actually requires our presence? Many scientific studies are linked https://www.genet...lergies. Try going to REAL science links i.e. based on ACTUAL scientific research which use rigorous modern scientific methods and scrutiny to establish actual causal links rather than stupid propaganda links from people with a political agenda that say any crap for political reasons. The REAL science shows absolutely no causal link. I demand PHYSICAL/MEASURABLE EVIDENCE from proper SCIENTIFIC studies, not mere hearsay and innuendos from obviously propaganda web links with an obvious political agenda, which, obviously, counts for absolutely nothing. Whether inside science or outside science, mere hearsay and innuendos isn't evidence for causation of anything and should be immediately dismissed as trash. You could show a trillion more such unscientific propaganda links with lies and unscientific innuendos and it would makes absolutely no difference; they would STILL be all irrelevant. The only links that count are the truly scientific ones i.e. the ones not there just to push a political agenda via misinformation and propaganda but rather backed up with REAL science based on unbiased research and backed up by ACTUAL PHYSICAL EVIDENCE. This is just the way REAL science works. You have yet to so any ACTUAL PHYSICAL EVIDENCE for your claim. I should also point out that the same crops could have been created to have those traits, albeit with vastly much more time and cost and very inefficiently, by selective breeding and with exactly the same impact on the environment, thus rendering the question of "what is the environmental impact of genetically modified crops" a completely wrong question and an irrelevant question. There I agree with you. The issue is not the way the crops are engineered but the whole industrial system for food production. GMO or not is not really relevant (yet I understand that people may be somewhat reluctant to eat maize that kills insects) but the herbicides, wast amounts of fertilizers. 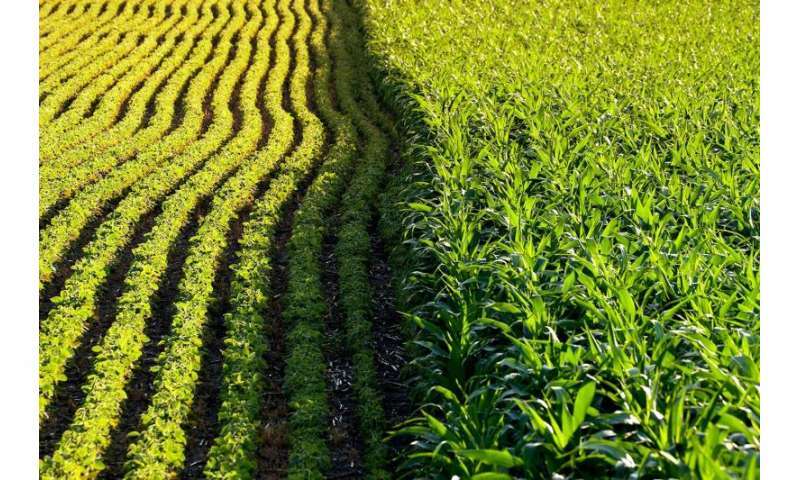 monoculture and the "one size fits all" policy for crop planning... adding that to the enormous waste and the fact that up to 60-70% of the calories of these crops are wasted feeding them to livestock (of which 50% goes to landfill too). Actually, the whole discussion is moot. I struggle to understand the "virus vectors" part. Are you aware that "virus vector" literally means something that transmits virus? Like a bird or a person? Do you mean that the GMO crops spontaneously create life? However, despite that, what he said about "viral vectors" there STILL makes absolutely no sense whatsoever and is pretty much complete gibberish. He obviously has complete ignorance of the basic science and doesn't know what he is talking about. The issue is not the way the crops are engineered but the whole industrial system for food production. It is currently extremely wasteful and I want something to be done about that. I should know because I was once a farmer myself. when I was a farmer some years ago, I and other neighboring farmers were often greatly angered by being forces to plough perfectly good food crops into the ground because of politics and/or because the market for that crop, without warning, had completely collapsed. Meanwhile, on the other side of the world, people, including young children, starve that would be saved if that wasted food was sent to them. If you really care about the environment, it is exactly THAT kind of thing you should try and put a stop to rather than be concerned with this totally irrelevant non-issue of GM. While indeed traits might be created via hybridization which are otherwise indistinguishable from those introduced via deliberate genetic modification, there is no guarantee that the hybridized genome will be the same as or even particularly resemble the genetically modified one. Thus either approach may produce unintended side effects not seen in the other. As hybridization is usually a much lengthier process, it is more likely that adverse side effects will be recognized before mass adoption of the resulting crops. You already got it, or not? How many links to scientific articles my link contains? Four subjects. FOUR. And their conclusion is that the so-called allergen is 'probably' an allergen and that it 'may' be transmitted to GMO soybeans. The study was in 1996. Showed a response in mice to do with a protein increasing their response to other allergens. Conclusion was that all crops need to have allergen testing and be assessed on a case by case basis. In fact, CSIRO decided to discontinue developing the alpha- amylase inhibitor GM peas because of that. No idea why you would link to that since it shows that any kind of immune response to the product leads to its development being discontinued! Is the same research with the same protein on the same pea. The weird thing is, I was expecting that link to be to some green ink site. Otherwise why link to it? But it's not too bad. And the hilarious thing is that the one piece (not science - opinion) I found on allergens and GMO cited only the two examples you did and cited them in relation to anti-GMO scaremongering NOT as evidence of GMOs and allergens. In fact, it concludes that GMOs are probably not the cause of a rise in allergies. So are you channelling these beliefs from your spirit guide or something? Because nothing you've linked to supports your contention. Like, even a little bit. To Humy... As hybridization is usually a much lengthier process, it is more likely that adverse side effects will be recognized before mass adoption of the resulting crops. Why wouldn't adverse side effects be recognized immediately anyway i.e. before mass adoption of the resulting crops? GM crops are ALWAYS tested before mass adoption thus any visible side effects should be spotted. As for any invisible side effects; I presume they won't be spotted regardless of how lengthy the process. I really fail to see any creditable danger here. This is based on an EIQ of 15.3 for Glyphosate, and that's supposedly because of negative impacts to birds, bees and fish. But Glyphosate is non-toxic to bees, the runnoff levels (as determined by the USGA) in our streams are ~1/7,000th the level we allow in our drinking water, and based on EPA tests it is non-toxic to upland birds. Given a realistic EIQ value the report would show what we can readily see in the environment. Use of GE crops is not harming the environment, and our ability to go to No-Till farming because of glyphosate has significantly reduced run off.